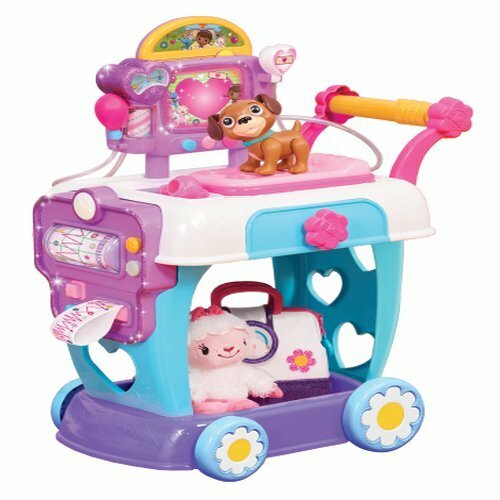 Doc McStuffins Hospital Cart is ready to give your toys their yearly checkup! 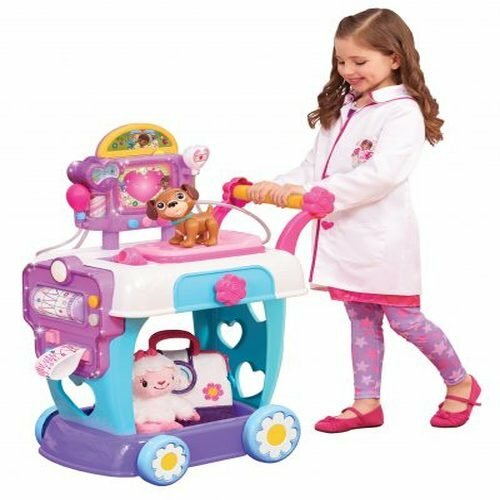 Why is Doc McStuffins Hospital Cart is the perfect gift idea? Because it’s not unusual to see a kid play doctor or pretend to doctor with his stuffed animals. 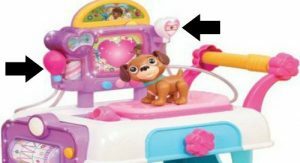 Voted as on of the 2016 Hottest Toys, Doc McStuffins Hospital Care Cart, goes along with the theme of the Doc McStuffins fourth season, Doc McStuffins: Toy Hospital. I am sure we will see lots of episodes where Doc fixes more toys. Don’t miss a single episode. You can find the new season on Disney Junior. Check your local stations for times and days. Watch a video all about it! 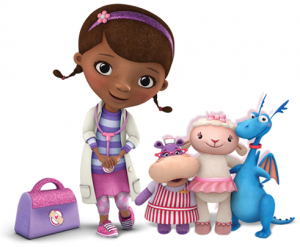 See the new Doc McStuffins Hospital Care Cart in Action! 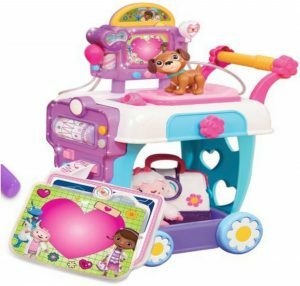 Kids can now be their very own toy doctor with the new Doc McStuffins Hospital Care Cart. It features lots of things that will make your little ones feel like a real doctor. It comes with a light & sound patient scanner with two interchangeable cards, a talking EKG with a printout EKG roller, a kid powered blood pressure pump, a real working drawer, and a patient bed. 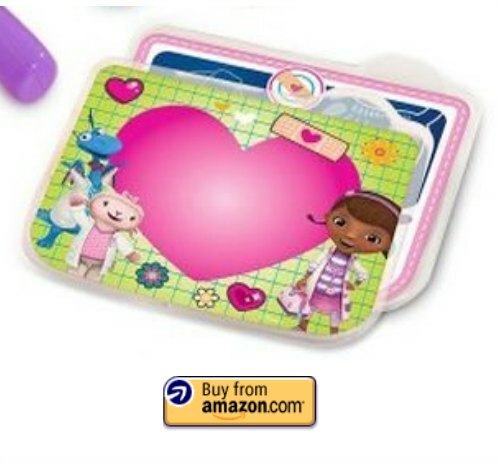 There are two patient scanner cards that come with the new Doc McStuffins Hospital Cart. You insert them in the top to get a different picture, sound and phrases. It is suppose to look like e x-rays and kids love to pretend to be real doctors. All the doctor shows have real looking x-rays, so now your kids can too. Once you put one of the scanner cards in the x-ray machine, it starts lighting up and talking. Kids love turning knobs and pretending to be using a machine. The EKG Machine with a print out is perfect for this. They can check their toys hearts and see how they are doing on the print out. The knobs all make clicking noises that makes it seem even more real. The print out spins, so it really doesn’t come off, but it gives kids the feel of actually reading the print out. They made this toy really well and giving the kids the true feeling of being a doctor. When I say true, I mean as true as kids think. It’s just fun…that’s all they know. They have packed so much fun in to this great toy! Kids won’t want to stop playing. Being able to push it from room to room will give them fun all day long. They can check up on all their patients/dolls easily since their cart is on wheels. If they don’t feel like a “Real” doctor while playing with this hospital cart, then I don’t know what to say. 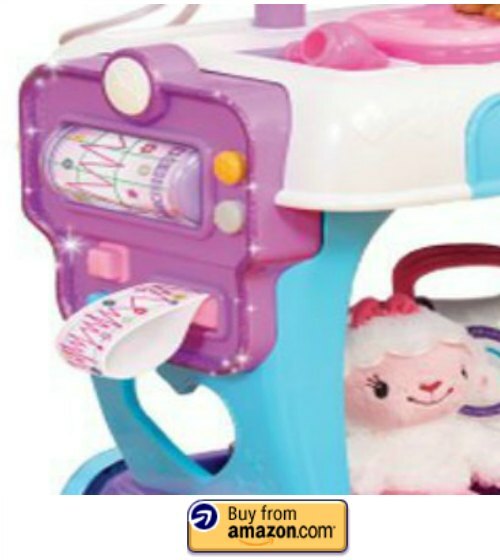 The New Doc McStuffins Hospital Cart has a blood pressure pump to take blood pressure of all their patients. While they are there, they can also listen to their heart beat with the heart shaped stethoscope. The hospital cart makes beating sounds when you use it. Its adorable! 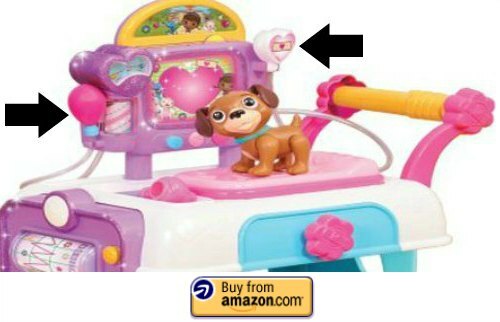 Puppy Fido comes with the Doc McStuffins Hospital Cart. He can be your child’s first patient. There is a built in exam table for all the patients to use when the Doc is checking them out. After seeing all the great features, I am sure you are ready to grab one for you kids. My grand kids can’t wait!! !